Well its been four days since my arrival and my head is spinning from all that's been going on, if you have been reading my tweets you will know I flew in with my little Brompton bike and have been tearing around the city at night stalking Tokyo taxi's. 95% of the Taxi's on the road are from the four main firms in the city, what I am after is the much rarer companies, some with as few as 7 cars on the streets bearing their unique taxi illuminations on the roof. It's been a real guerrilla affair riding one handed with a primed Hasselblad in the other, I have to be very quick when I spot a new company sign. Literally chasing after the unsuspecting driver who is looking for a fare; so a lot of the shots taken on this trip were done while still in the saddle. Knowing this series will be printed in edition sizes upto 200cms I have been shooting all this at 100iso so trying to regulate my breathing for a shot after just having chased a moving car down has proved testing, blurred shots and high iso's are a waste of time. When I catch them parked up on a rank, I have a confident enough dialogue to explain what I am doing and the drivers are always very happy to have me do my thing. Any further than that my Japanese really does need more regular practice and trying to learn kanji is making my head hurt, last night I sat in a lane way sushi bar in Akasaka - whose name and the entire menu were only in Kanji - no idea what I ordered but the food was superb. The tables were full of happy drunk guys all wearing dark suits, smoking, drinking, laughing - I truly was a happy man lost amongst it all writing this diary entry. There are very sensible power conservations reaching the city which has seen the lights of ginza turned off at an early hour - common sense I know but it is very eerie for those that know Ginza at all. I feel awful knowing that these wonderful people are still having a terrible time in the stricken region. I wish I could do more to help; life in the city seems so surreal. It is a cliche to say it, but until you stand still and really look around this place, you realise that it is like no other city in the world. The way the infrastructure is designed to interact with daily life on every level to facilitate a city en-mass. Super fast highways blast overhead right through the busiest of shopping hubs with thousands of people on the streets below; passing unnoticed to all but the 'Gaijin'. You can feel trains thunder deep underway, the place just pulses with energy. Buildings become a labyrinth of shops, restaurants and bars on every floor and due to building density your only way of knowing is the vertical signage outside. In the west restaurants are at street level generally, here everyone would starve if this model were employed, so they go in and up. But I still go for the street level thing - so I do deserve the Gaijin tag I guess. So here are some more images from last nights shoot which was assisted by Teito Taxi Co. My thanks Miss Aya for helping be my translator and to the Teito team down at Shimbashi for their time and courtesy. 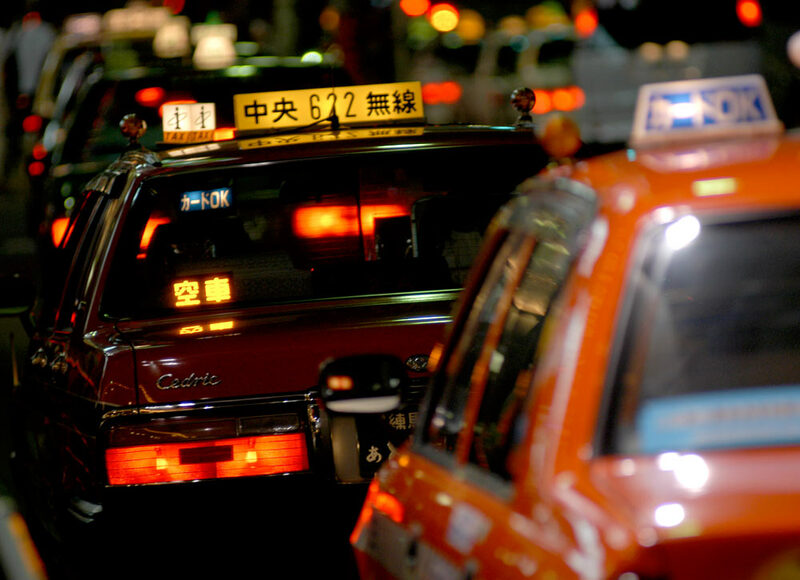 Teito Taxi Co. was the first registered taxi company in Tokyo back in 1938 with a fleet of hand pulled carriages. These days they run a pristine fleet of my favorite Japanese taxi's, the Toyota Crown which may seem dated by today's design standards but it has a very relevant place in the heart of Tokyo.